This is a re-recorded riff that I posted before. Slowly getting some recording equipment. I used to make a bunch of cover videos, and decided to finally make one with my Rockerverb 100. I thought a Kvelertak song was fitting as their 3 guitar players all use Rockerverbs live. The guitar is recorded straight into the amp on this one. No pedals. Just a small bit of EQ afterwards. If you skip to the song Hush, Hush on the "Easier Without You" release you can hear the reverb that these old combos have. 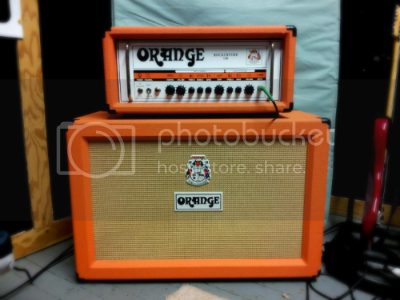 There aren't many sound clips of these vintage Oranges with built in reverb. I took the head out of the combo it was in and ran it through the open back 212. I then took the spring reverb out of the combo and drilled it into the 212ob. Hey guys, me again with more recordings of my Rockerverb 100 MKI. I just released an album and the guitars are entirely Rockerverb except for some ambient e-bow stuff. I played an LTD MH-250NT straight into the amp and PPC212 cab most of the time, using a Maxon OD808 occasionally. Reverb/echo on the lead guitars was done in logic after the fact. Equipment: Warwick Thumb NT 5 bass tuned down to full steps with controls flat, Orange Terror bass 500 with bass, treble and gain at noon-ish, mids at full. There's also a weeping demon wah in there at some point. OR15 Metal Riffs... just because it can do pretty much everything and do it well. Orange OR15 and PPC112 (V30) and a PRS Singlecut Trem with a DiMarzio Crunch Lab and LiquiFire. No effects, but I use an L-Pad to get more volume control.